iPad 2: The Best New Feature for Teachers, Presenters & Trainers? Video Mirroring! It was great to see Steve Jobs take the stage to announce the iPad 2. This new iPad is thinner, faster, lighter, comes with two cameras and a choice of two colors. 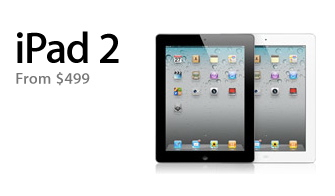 iPad 2 keeps two of the best features of the first iPad, the price (starting at $499) and battery life (10 hours). I found myself longing for the clarity and convenience of a direct display connection. This new iPad model arrived just in time too. Later this month I’ll be leading the third in my series of workshops. The topic? Presenting with the iPad. We’ll be exploring apps, accessories and settings that can help to reach and teach any audience. Looks like I’ll be adding some brand new content to what I’ve already planned. Apple also has a new Apple Digital AV Adapter to connect to HDTVs. For more on the new iPad 2, visit Apple’s iPad site or see this article by Jason O’Grady over at ZDNet. So no mirroring on first generation iPad. I ran across your site, and I have given a quick tip of the same sorts (using an Elmo) about two weeks ago after trying to find a way to mirror the iPads screen. Of course the clarity does suffer, but it is a really great idea. My wife is a 4th grade teacher, and she uses an iPad 1. So this works for us just fine. My website isnt much to see just yet, as I am building it as an extra credit assignment a college class. http://www.iappsforteachers.com. Always glad to have fellow educators visit. Almost any document camera (visual presenter) will work. The Elmo is a popular brand. Congrats on getting your site up and running and good luck with the grad classes. Hi, stumbled on your site and like it. Any idea if the Video Mirroring will work on series 1 iPads? Will it just require the software upgrade plus the HDTV adapter? Brian – Thanks for the kind words. Ability on iPad 1 not clear to me yet, though I strongly suspect the improved graphics capability of iPad 2 is what supports the mirroring feature. 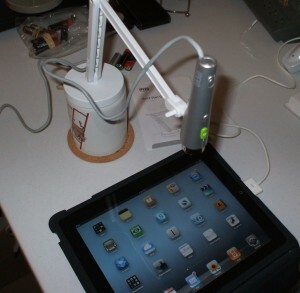 iPad 2 mirroring should work with both the current VGA adapter and the new Apple Digital AV Adapter. I’ll test VGA mirroring with iPad 1 soon after I get iOS 4.3 update, though I believe that only apps that support video out will be able to use the VGA or the Apple Digital AV Adapter with the original iPad (no mirroring). Meanwhile, I’ll be checking with other sources. Stay tuned!